Coal Country Picked Trump. Now, It Wants Him To Keep His Promises Voters in coal country overwhelmingly chose Donald Trump. They liked his promises to create jobs, even if they didn't like his other rhetoric. Now, they're waiting to see if coal can make a comeback. President-elect Donald Trump's promises to bring back miner jobs and open mines appealed to many voters in coal country. From West Virginia to Wyoming, coal country overwhelmingly voted for Donald Trump and his message that he will bring coal jobs back. Now, those same voters are eyeing his incoming administration closely, careful to see if he will keep his promises to revive the coal industry and get miners back to work. These hopes have become increasingly desperate as the industry has floundered. U.S. coal production in 2016 is projected to be at its lowest level since 1978, and over the past few years, the country has lost about 30,000 coal jobs. That means hard times for places like Wyoming's mineral-rich Powder River Basin. Three of the region's four main coal producers were in bankruptcy in 2016. Two of them laid off hundreds of miners at once. Still, the community of Gillette, Wyo. — self-proclaimed as the Energy Capital of the Nation — is breathing a sigh of relief lately. Production has ticked back up past where it was at this time last year, and some mines are even hiring workers back. "I do believe that my friends and co-workers are safe for now," says coal miner Stacey Moeller. She believes that "for one more year, we're going to be coal miners." And Trump's win has buoyed her hopes, as well as those of investors. 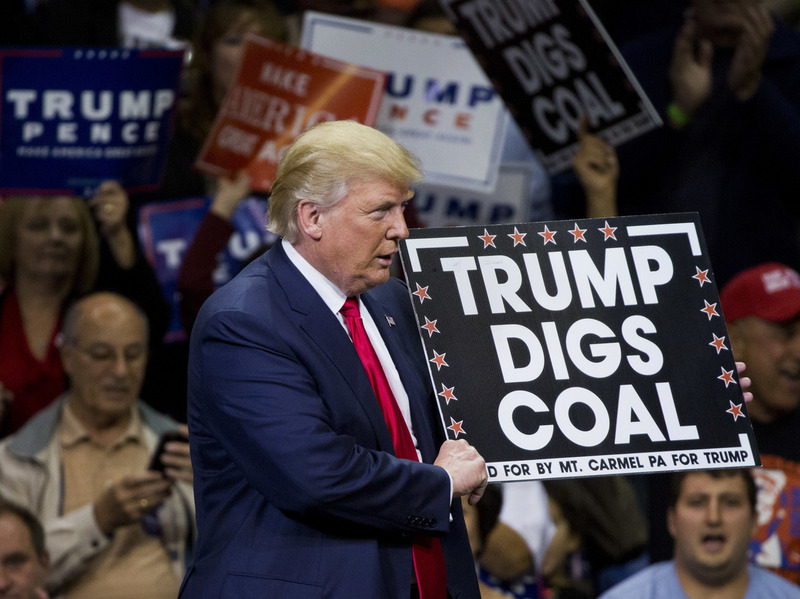 The day after the election, coal stock prices leaped and many in coal communities celebrated. For Moeller, a single mom and lifelong Democrat, the decision was complicated. "I did vote for Donald Trump," Moeller says. "It's really hard to even say that because I so dislike his rhetoric. But I voted for him on one singular issue, and that was coal." Dave Hathaway of Pennsylvania will be watching Trump, as well. Since the coal mine he worked in closed a year ago, he spent much of 2016 looking for work. The search gained urgency when his son Deacon was born in August. On Election Day, Hathaway made a choice he hopes will help his long-term job prospects. "I voted for Trump — I mean, a coal miner would be stupid not to," Hathaway says. He says he's had a hard time finding a job to replace the $80,000 he made working in the coal mines under Greene County, Pa., a few miles from the West Virginia border. Hathaway recently found a job at a nearby mine. While he thinks Trump's election means he'll have a better shot at keeping his new job, he didn't like a lot of things Trump said during the campaign. "He is a whacko; he's never going to stop being a whacko," Hathaway says. "But I mean, the things he did say — the good stuff — was good for the coal mining community. But we'll see what happens." That message clearly resonated in Greene County, where over the last four years a third of the coal mining jobs — like Dave Hathaway's — disappeared. Trump won the county by 40 points, eight years after Barack Obama basically tied John McCain there. Tom Crooks, vice president at R.G. Johnson, a construction company that builds mine shafts, witnessed the decline of the coal industry firsthand. "Two years ago this week we had 145 employees," Crooks says. "Right now, we have 22." Crooks doesn't use the phrase "war on coal," but he does think federal regulations mounted by the Environmental Protection Agency under President Obama have weighed down his industry. One example is the EPA's Clean Power Plan. That rule, which Trump has pledged to eliminate, limits the amount of carbon dioxide from coal-fired power plants. Instead, Crooks wants to see more government research into making coal as clean as possible. "Really, what's happened over the last eight years is the smart people stopped working on coal, in part because of the way the federal government and the state governments looked at us," Crooks says. "We just want them to start looking to coal as an option." Leigh Paterson is a reporter with Inside Energy, a public media collaboration focusing on America's energy issues. Reid Frazier is a reporter for The Allegheny Front, a public radio program based in Pittsburgh that covers the environment. An earlier version of this Web story said three coal companies in Wyoming's Powder River Basin declared bankruptcy in 2016. In fact, two had declared bankruptcy in 2016, and one had done so in 2015.